MSN programs prepare nurses for positions such as nurse anesthetist, nurse midwife, nurse practitioner, or head nurse. An MSN is often the prerequisite for a doctor of nursing practice (DNP) program, and it is a required credential for nurse educators. A typical MSN program takes up to two years to complete full-time, or three to four years part-time. The healthcare industry is facing a shortage of advanced practice registered nurses (APRNs), and this shortage is expected to continue for many years. Nurses with an MSN degree thus have one of the most favorable career outlooks in the healthcare industry. Besides ample job opportunities, New Mexico’s APRNs can expect annual pay of $94,000 to $118,000 per year, depending upon their field of specialization. New Mexico has several accredited MSN programs. The majority are offered by the state’s large public universities. 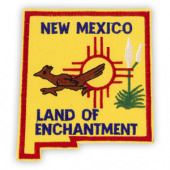 These include University of New Mexico at Albuquerque, New Mexico State University at Las Cruces, and Eastern New Mexico University at Portales. To help the state’s aspiring nurses find the best programs, we’ve compiled below a detailed list of New Mexico nursing schools with accredited MSN programs.